Haegue Yang, Three Folds and Multiple Twists (detail), 2013, venetian blinds, dimensions variable. 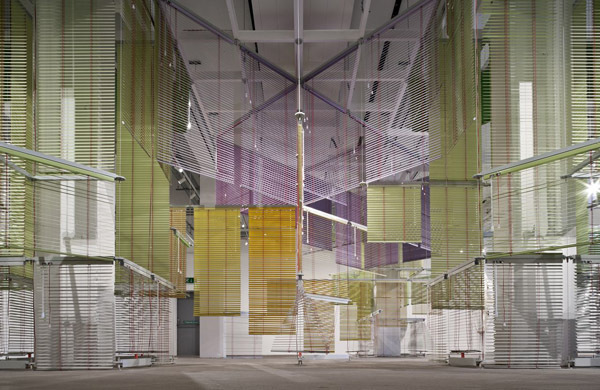 Haegue Yang is a Korean artist based in Berlin and Seoul who is well known for working with mundane materials such as venetian blinds, decorative lights, and fans. Yang completed a three-month residency this past summer at the Glasgow Sculpture Studios, resulting in the production of her current exhibition, “Journal of Bouba/kiki,” which is her first solo show in Scotland and is now on view GSS’s exhibition space. The show runs until December 20, 2013. I WANTED TO DO this residency because I wanted a challenge: to be somewhere unknown without my team or my studio, and without the facilities and suppliers I’m familiar with. At the same time, I used this opportunity to commit myself to learning new techniques, such as ceramics and macramé. By working more organically with what was around me, I opened myself to new opportunities. I ended up producing four bodies of work that are all on view in the show: one with ceramics; another with macramé—something I always wanted to work with; and the third became a combination of reading, editing, and taking photographs of public places in Glasgow, such as the Botanic Gardens and the Necropolis, a Victorian cemetery. The fourth project, Three Folds and Multiple Twists, is something that most audiences will readily identify as my work; it’s a venetian blind installation. This time, however, the blinds are subtly twisting, instead of moving up and down. All of these works deal with very specific material concerns as well as the economy of labor, fabrication, and craft, while exploring dualities of the organic and man-made, industrial and domestic, technical and lo-fi. The macramé piece, Floating Knowledge and Growing Craft—Silent Architecture Under Construction, was very time-consuming, so I listened to podcasts, online radio stations, and music while working. For the show at GSS, I’m showing these pieces alongside an iPod, so the viewer can hear the same podcasts that I was listening to. To me, this feels like the “unedited” work in the show. The third work, Glasgow Tales of Laugh, incorporates ten panels relating to Victor Hugo’s 1869 novel The Laughing Man. While reading this book again, I visited places in Glasgow and made photos—I haven’t picked up a camera in ten years. My piece revolves around a monster figure with a laughing face from the novel. He’s a special being. I saw laughter as a metaphor in the book—a pleasing action, but also a setting-free action. Everyone needs to laugh. To create the ceramic pieces, I learned to work with clay and the process of forming, firing, and glazing—casting my hands in six different poses. Simply put, the hand is what I use to make something, but these hands, separated from my body, have their own process of interacting. Like the narrative on the panels, they also relate to my interests in oddities and monsters—sacred beings of society, in my view. The exhibition is titled “Journal of Bouba/kiki,” referring to a scientific term for the way people who speak different languages tend to associate certain linguistic sounds to certain forms in a consistent way. We usually talk about the randomness of the relationship between language and reality. But what interests me is the common sense between them. This show presents a kind of journal of what I have experienced in Glasgow—I’ve been sensing the bouba/kiki effect every day, finding mysterious threads between things that would usually not seem connected. That is ultimately what framed this residency.